Honda engineers always have tried to do some really innovative things with the minivans that they design, and those risks have paid off bigtime over the course of the last handful of model years. 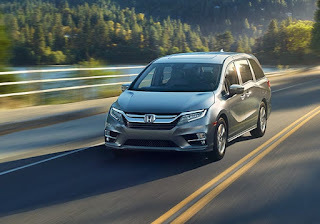 The Honda Odyssey was really the first of the minivans to integrate a much more modern, stylish design, and it certainly was the first model to include a built-in vacuum cleaner, a feature that has since been copied by other manufacturers. You know what they say about imitation and flattery. From the moment it became clear that the Honda CR-V was going to remain an undisputedly popular SUV in the country, Honda knew it would be wise to take advantage of the buying public’s hunger for crossovers by developing another similar (but smaller) CUV that has in its first year of existence already become a leader in the booming subcompact SUV segment. That vehicle, the Honda HR-V, now enters a new model year, with the 2018 Honda HR-V models arriving here at Pacific Honda this month. We all know that the future of automobiles probably is going to be electrification, and Honda engineers are ready to show their version of that future a little early in the guise of the completely new 2017 Honda Clarity Electric sedan, which found its way to Honda dealerships in San Diego,CA earlier this month.